Yesterday I spoke to Rob Caiger about the reissue of ‘Diamond Jack and the Queen of Pain’. He is on a short deadline and needs our help. Please read the message that he asked me to circulate. 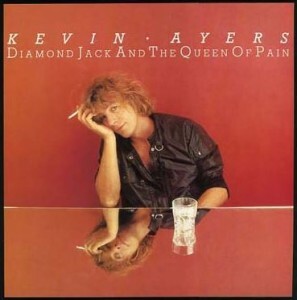 Hi Rick, I am the reissue producer for the remaster of Kevin Ayers’ 1983 album ‘Diamond Jack and the Queen of Pain’. What we are doing is reissuing this at the best possible quality and if I can, create something where the fans worldwide can obtain the album direct together with a limited edition facsimile copy of the 7-inch single which will be exclusive to them. The best way I feel we can do that is via your excellent website and Facebook page. The album has been out of print for over 30 years and has never been reissued on CD. As a fan of Kevin’s work, I know this period was a difficult time and information on the recording and songwriting is almost non-existant. But as a fan, I want to make this release the best it can possibly be because quite frankly, Kevin deserves it! He touched and influenced people on many different levels and I feel as a record company, we also have to do something different and more than just reissue the album. Therefore, what I would like to do is invite fans and friends to contribute to the album, be it in appreciation of Kevin’s talents, his inspiration, or whether they have any memories of Kevin during the period of recording and promotion, any photographs or memorabilia, press reviews – anything! Any memories of Kevin’s long-term collaborator Olli Halsall would also be welcome. So far we have just completed remastering the CD with Nick Robbins at Soundmastering Ltd. while the 180gm vinyl audiophile album has been cut directly from the original Audiofilm Studios analogue master tape by Matt Colton at Alchemy Studios. The CD will be issued as a hardback mediabook edition and contributions from the fans will be included with full credit while the LP will have a newly designed inner sleeve featuring the contributions. And I have two weeks to pull it all together so if you could spread the word, I’d appreciate it! Please comment below or use the contact form to pass any information you can onto Rob. I can help you out regarding Kevin’s album if my memory serves me well! I knew the man, and I spent time with him and the Softs and….beyond! Thanks Napo, I’ll pass this onto Rob. please, let me know when the “diamond jack and the queen of pain” cd would be released and where i could buy it. I think “My Speeding Heart” is one of Ayers’ greatest songs! I remember hearing it on college radio in the 1980s and, at first, being put off by the synths and the discofied production…..but the hook is irresistable! The lyrics are good too. Y ears ago, I did my own cover of the song, but I had lost the tape I had of it, so I just improvised my own (lousy) lyrics. When I got to hear the song again, years later, I winced, because it was obviously a heartfelt, honest lyric. That turnaround, getting into the chorus….and the back-ups…..it’s just full of hooks! I love that song! Can’t wait to hear the re-release because, honestly, I’ve been looking for it for years, and I’m not as into the version on “Deja Vu”! Not sure Martin, we are considering having a Diamond Jack party here while we are waiting. It would be really keen if y’all could date yer comments and, especially, posts. I have no earthly idea if the exchange above took place last week or 10 years ago. I’ve had the CD on preorder since the putative 1 September release date. That’s a fair point Bill – that’s now done. We keep referring to ‘The Curse of Diamond Jack’ – since the moment when we played the test pressing on my birthday (April 7th 2014) – which was followed shortly by quite a sizeable earthquake! Fairly common in this part of France, but there was something unearthly about the timing and magnitude of that one. Preordered back in the Paleolithic, then month after month of delays advised by Amazon, and now, all of a sudden, it’s not going to be available at all. Anyone know what the flippin’ heck is going on? I’ll try and find out. As far as I am aware, the product is finished, but needs some paperwork (from the 80s) to get it released. We regret to inform you that we have been unable to source the following item: Kevin Ayers “Diamond Jack And The Queen Of Pain”. Our supplier has informed us that this item is no longer available. This item has now been cancelled from your order and we can confirm that you have not been charged for it. Usually they just prevaricate, but this sounds like they’ve given up. Amazon don’t usually give up on any opportnity to turn a profit! when and if are “diamond jack and the queen of pain ” and “howling at the moon” cds being released? I’m afraid at the moment we have no idea. As soon as we have any information we will let everyone know. Next post: Something In Between?